In the days of old when stories were told of how love blossomed and marriage was sacrosanct, it was these stories that captured the imagination about what love was supposed to be about. But the rise of female equality and education has meant that we have changed our relationship with love and the dynamics within romantic partnerships. 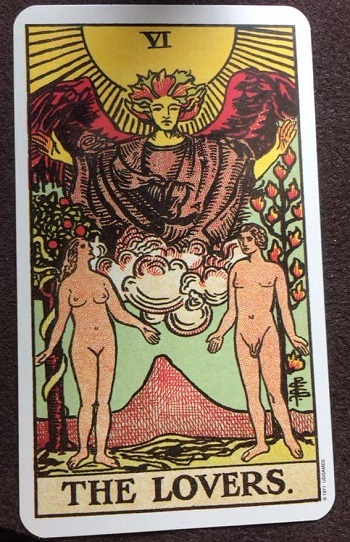 The lovers card in the tarot depicts two people entwined in a love filled Union with both male and female aspects equally positioned. Their connection is one of mutual respect, humility and personal empowerment. It is in this way that both are mutually respectful of the other and yet each can feel whole on their own terms. You can see a balancing between the two such that if one was to let of their wholeness, the other would also 'fall' into imbalance. The relationship I am referring to is that of the Twin Flame Union. The Buddha mind is what we need to achieve in order to attain the twin soul re-union. We make sure that we understand ourselves more deeply so that we can more deeply understand how others impact our reality. So what do we mean by a ‘Buddha Mindset’? The Buddha mindset is where someone has attained a peaceful demeanour in spite of any emotional turmoil that maybe going on in their heads. The Buddha mind is a symptom of what you have achieved through overcoming obstacles, trials and tribulations and challenges to both personal and physical circumstances. The Buddha mind is such that you can erase the elements that hold you back from feeling free to create, play, wander and love. Why upset the status quo when peace can reside inside a mind that is serene, focused and pliable. A serene mind is one in which you can hear the clarity of your inner voice and represent that in your outer world. The Magician card (See Part 1) indicates an ability to manifest your desires through having all the elements of Wands (Fire), Swords (Air), Cups (Water) and Pentacles (Earth) in balance. When any of these become out of sync with the message that is being transmitted through the voice of clarity, then adjustments can be made to realign with energies needed for its manifestation. So the lover's journey is one of coming into balance with your inner essence before transcending that love of self to join with your complementary twin soul for Union and ultimate energetic potential. The Journey starts with a knowing that something is missing which leads to a desire to seek the truth or understand how better to fill the void of emptiness and meaningless activities. 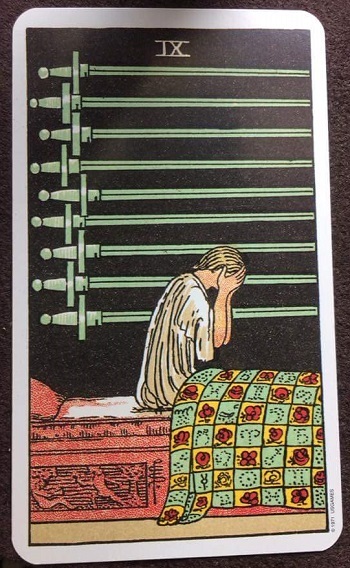 The first card in the tarot that represents the journey of love is the 9 of swords followed by a specific set of cards that lead to ultimate Union and a sense of completion. 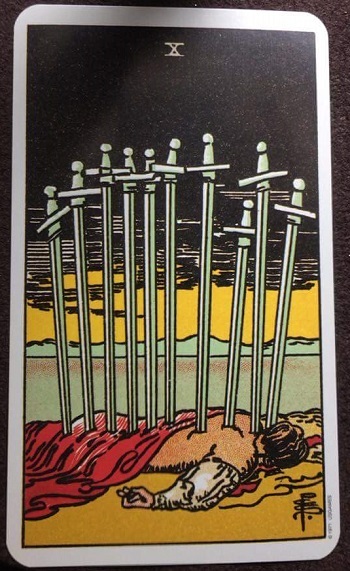 9 of Swords represents the kind of humiliation from not understanding the self. By humiliation it is meant that once you know something is missing, you realize you don't have what it takes to fix it in terms of energetic liberation. A figure raises their hands in despair to hide a face racked with shame or guilt about not being good enough. 9 Swords are laid out in parallel lines against a black background which could be a wall or a dark space filled with nothing. The person in this cannot see a way out of a dark situation. The bedding is adorned with red coloured roses and flowers which depict the base chakra of feeling safe, secure and in control. The green squares represent the heart chakra that creates the messages that need listening to as it transmits the highest quality information pertaining to our life's purpose and mission. The yellowy orange in the quilt represents a blend of both sacral and solar plexus energy which related to relationships and personal power. It is this personal power that has been distorted in terms of relationship harmony and therefore a sense of hopelessness ensues as to what can be done to fill the void of despair. Reversed, this card represents inner turmoil as opposed to external influences. The individual may lack self-belief and confidence, feel lost and out of control while trying to maintain a sense of identity. Essentially this phase could represent a time of experiencing the 'dark night of the soul'. The next card represented on the journey of love is the Ace of Cups. 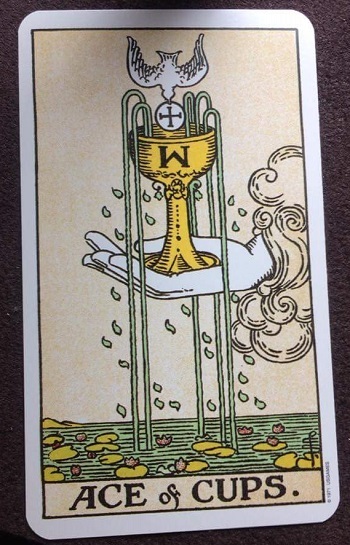 In this card is the notion of overflowing emotions – my cup runneth over - meaning that your cup is filled with the highest quality emotion that you can think of depending on the situation. So it might be love, gratitude, compassion or forgiveness, all of which have their vibrational mix or tone. The resistance to feeling such high vibrational emotions, as depicted by the card in reverse, represents emotional blocks that stem from childhood trauma, abandonment issues and other less vibrationally supportive beliefs, ideas and conditioned behaviour patterns. We now have the option of changing what we feel, think or believe in a way that supports our highest potential. But for some reason we find change a threatening concept due to its ability to break the concept of who we think we are and therefore destroy our perceived sense of identity. Water represents emotions and when they flow freely they are allowed to be expressed and so avoid stagnation which can lead to dis-ease. So letting go to let love flow is the key to a healthy emotional response as we are supported by the hand of love and it will always be on the other side of fear, doubt, misery and angst. 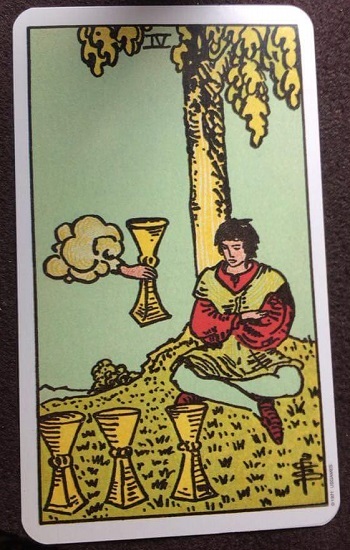 The 4 of cups reversed represents a refusal to see the potential for change. The man in this picture is too focused on lower density emotions and is closed to new ideas about who he could become (See my article Becoming the Love you Wish to See). However, opportunities are there for the taking if only he would look in the direction of his dreams and believe in the possibilities that lay before him. Instead he is focused on his current reality in which it feels like this is all there is. But knowing you can manifest your dreams as depicted in the Magician card, can help you turn your vision towards more hopeful and inspirational pursuits. 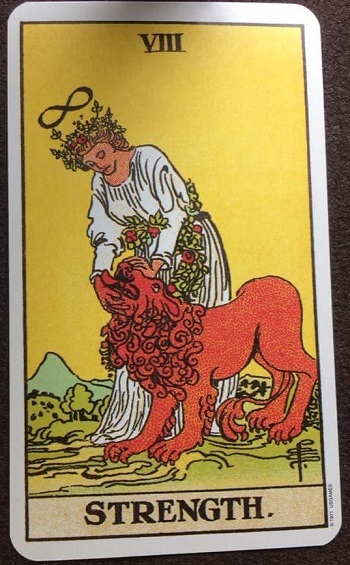 The strength card represented by the Lion who is being held by a feminine figure who is unafraid to look into its mouth is indicative of how it feels to look deep inside the jaws of change at our deepest darkest fears. Yes we need strength and courage to face our deepest emotions but once we grab the bull by the horns 'so-to-speak', or the Lion by the jaws, we see that our fears were just illusions and begin to take on a less threatening demeanour as this Lion with his tail between his legs. But our fears are being dealt with gently and with compassion, love and understanding by the female figure adorned with roses and greenery and dressed in the purity of her white gown. 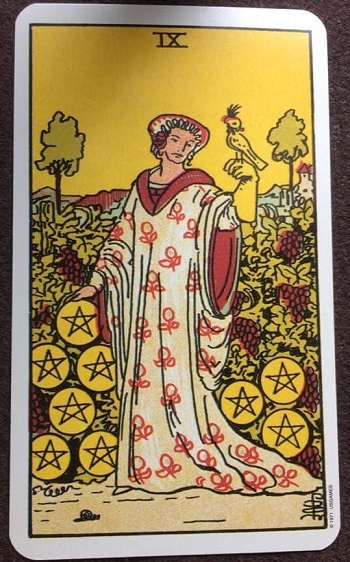 The 9 of Pentacles is about success and prosperity. The figure in this scene is adorned and surrounded by abundance. She holds a hawk in a gloved left hand showing trust and stability in overcoming 3D physical fears. The hawk represents her darkest fears as it can strike at any moment. But she is facing her fears and looking them in the eye with a sense of knowing she is protected by the glove of 'love'. Having gone through a process of transformation she is becoming skilled in 'handling' her fears in a way that sets them free to fly away but protect her should she need to avoid danger. She makes fear her ally instead of her foe. The coins represent physical abundance in new opportunities, insights and understandings, opening the doors to greater freedom and generosity of spirit in all areas of life and love. 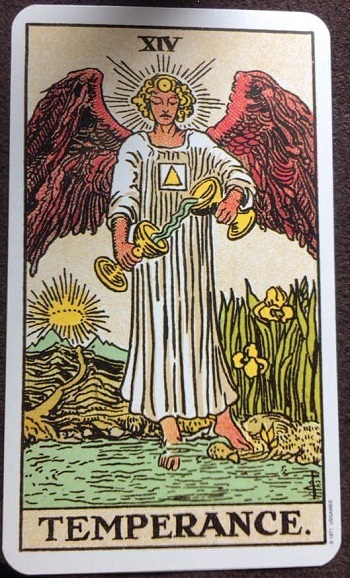 The Temperance card represents a balanced view of emotional content as depicted by the two cups sharing water between them. The figure has one foot in the water and one on the ground balancing emotion and intellect. She has two red wings and a gold Sun on her forehead representing spiritual focus at the same time as being grounded. In reverse, this card represents a time of testing emotional fortitude as well as being unbalanced in certain aspects of experience. In the case of relationships this represents too much focus on the other person and what they can do for you and can manifest as being too needy, too aloof and not taking responsibility for your own happiness. Any relationship requires a level of give and take. This card teaches that this is what is being taught at this time. Balance is the key to any good relationship but we all go through stages where the heart is tested or even broken in order to come to a space where you no longer rely on another person to make you feel whole. 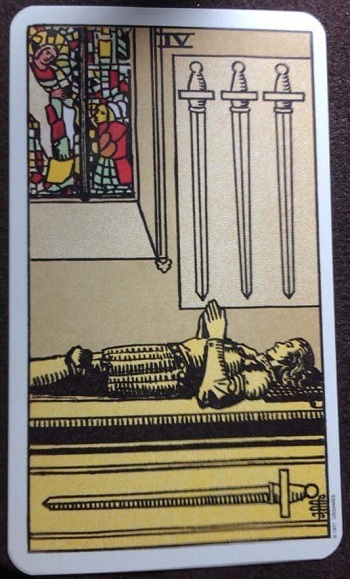 As the picture shows, this card can indicate you are feeling 'left for dead' after all the 'toing and froing' of learning the lessons in love. The number 10 represents an ending of a situation that left your feeling exhausted, spent or downright defeated. This is the point of surrender and letting go of all that does not serve you. In this phase of the lovers journey the individual sheds his/her identity as something that no longer suits their way of being. The dark clouds can represent another dark night of the soul that portends to a new dawn on the horizon. The figure in this image is yet to 'wake up' from his unconscious sleep and recognise the blessings that are just beyond his reach. The 4 of Swords represents a process whereby you heal your wounds from past hurts such as betrayal, injustice and purgatory. The loss of identity supports a new vision that makes knowing who you are a more fulfilling outcome. It is the card of acceptance. The stained glass window indicates a brighter future and infinite possibilities. But the figure needs to 'rise' up in order to 'see' out into the future. This is where positive thinking and personal development come into their own. This is where counselling, personal therapy and emotional healing are pursued by the love on their journey towards Union.